I personally do not remember this scene, but I was just like the others in believing there’s no way the Scarecrow had a gun. It doesn’t make sense. Yet the scene is there. I wouldn’t say I’m a devoted fan or anything, but I’ve seen the movie a number of times. As an experiment, I asked my friend to watch the scene without telling her anything. She has seen the film numerous times. I asked if she noticed anything out of ordinary. She didn’t notice anything. I showed it again, and yet again she couldn’t see anything weird. I think that’s at the heart of what we are dealing with here. It’s an obscure thing that has no right or context to being in the movie, and it’s hardly noticeable even when asked to be aware. It’s only when we point out these oddities, the viewers become aware of them. While my impromptu experiment doesn’t conclude anything, I feel it at least raises some points on how this could be missed or completely forgotten. It was brought up again in popularity (and my mind) recently due to a Cinemassacre video on the subject. “The Jitterbug” took five weeks to rehearse and film and was cut from the picture after the first preview. Here is the complete track of the number accompanied by more of Alren’s home movies made during a camera rehearsal of the song; a brief opening portio[sic] of the number is covered by stills of the stars. The jitterbug itself was a pink-and-blue-mosquito-like creature who – under direct orders from the Wicked Witch – stung the principal characters and sent them into a frenzied dance in the Haunted Forest. While the video above doesn’t directly explain the items, it makes sense they were given them to fight the Jitterbug, especially the Lion’s bug catching net and pump-sprayer. It also matches up with the scene taking place in the Haunted Forest. According to “ninaplays“, a Redditor, she or he also mentions that depending on the version or “print” you are watching, it’s possible that the Haunted Forest scene in question may have not even appeared. Additionally, a lot of the prints of the film are poorly restored, and in some cases, to make out the finer details of the gun, or any other items the cast members are holding is quite a hard task indeed. Thus leading to even further obscurity. Notice anything weird there? Besides the whole scene being lit by daylight, Dorothy’s missing her ruby slippers, and appears in a red dress instead? The Scarecrow’s colors are also off (they used blue and purple instead of green and brown). They even forgot to color the gun properly. Maybe the artists didn’t even see it and thought it was part of Scarecrow’s hand? That definitely crossed my mind watching the scene as well. It could have been mistakenly be seen as his finger or hand, especially if the print you were watching was dark or muddy. As erik larson mentions in the comments, lobby cards were often produced by third parties and involved colorizing a black and white frame. It’s likely they guessed at the colors. It’s also weirder mistake given that this lobby card is for the 1949 re-release. The production, restoration, and continuity of the film is a mess. The Movie Mistakes website entry for The Wizard of Oz has 22 pages of errors (which features this “Mandela Effect” funnily enough). This scene appearing in the movie with inexplicable items is not out of the realm of possibilities. Everybody Run, The Scarecrow Of Oz Has A Gun!!! Scarecrow in Wizard of Oz with a gun? A ME that made me laugh was the Loony Tunes one. That it was once spelled Loony Toons. They forget both Loony Tunes connection to Merry Melodies and confuse Tiny Toons with Loony Tunes. I also think movies like Roger Rabbit perpetuated the word toon in the household. I remember watching looney tunes spelled that way because when tiney toon’s came on it was spelled “tiny toons” and i noticed the difference. What is it now? I’ll look it up but i don’t know how it is spelled now, If the Mandela effect has changed the way it was spelled. I’ve not heard of this one until now. Will update BRAIN. I totally remember Scarecrow having a gun. On the whole Looney Tunes/toons thing. I had a Space Jam ToonSquad basketball top I remember it clearly because I used to copy the writing of the top because I loved how the letters joined up. I remember the double O as it looped into the other! Now anything I find says Looney Tunes but I’m not misremembering, I copied it off the shirt everytime I wanted it perfect. Sammi, please show a picture of your top, that would be awesome! I’m really very sorry, but I have a difficult time trusting your memory on this one. You’re talking about movie merchandise from 1996. There are people reaching the legal drinking age who were born in that year. I myself have an excellent memory, but even I can’t recall fine details like this from my youth or adolescence. People are constantly reaching legal drinking age. I’m very happy for seeing this post and glad about this video. Sammi: And yet every Google image of a TuneSquad shirt is spelled TuneSquad. You’re more inclined to believe your human memory, which science has shown us is extremely unreliable, over reality itself. Regarding the Tunes vs Toons thing. I clearly remember toons. I do. In fact, I remember making that mistake when I was a kid, and being corrected by someone. It was toon, not tune. A short time later, Who Framed Roger Rabbit came out. Calling the characters toons there, made sense, given the context. I didn’t question it. The Mandella affect/ ME. Is 1000% Real, wether it’s Scarecrow w/ A gun, A New Ford Logo (that never existed prior to 2007-2012), or the Star Wars Hallmark C-3P0 w/ A Silver Leg. There’s A Glitch in what we once new as reality…..
My Ford logo tattoo has the curl in it. Wierd. I don’t particularly like the film Wizard of Oz, but I have seen it a few times, not that I remember any specifics. Like it was pointed out, this is most likely due to the fact that there were cuts, run time will be made to fit certain advertising schedules and therefore depending on the network may omit parts entirely. But I always thought that Looney “Tunes” made complete sense as their work had few spoken parts (Tom’s screaming was always hilarious) and was like 98% orchestral, which I guess was so that it could be viewed worldwide without having to translate much and thought it was a pretty solid idea really. As for the Tunes vs Toons, people are most likely remembering Tiny Toons (baby versions of the original Loony Tunes characters) and blurring it with Looney Tunes. I even remember thinking “oh, so it’s toons now?” when I got a Tiny Toons Gameboy game. Looney and Toons both have an overlayed “oo” on their titles although slightly different of course, probably causing some blurred remembering. I highly doubt that, unless shown evidence, it was indeed ever Looney Toons. A video of the first episode was uploaded to Youtube 7 tears ago, with Looney Tunes in the opening. It’s kinda funny how everyone is relying on memory with no proof. Please, someone give me proof. Hmmmm…now when you say “Tom’s screaming was always hilarious”…WHOM are you speaking of? Tom the cat? as in “Tom and Jerry”? I haven’t checked out the Field of dreams again, but I remember ‘if you build it he will come’, referring to Kevin Costner’s father. But I thought that later in the movie they repeated the line but changed it to ‘they will come’ as James Earl Jones is talking about people just showing up late in the movie. But there are other ”glitches” that I feel absolutely sure about. Like Mr Rogers welcome song the Kit-Kat dash, and the VW logo. I remember first noticing the Scarecrow’s gun in the 90’s, after having seen the film countless times. This is also about the time the film was restored for the 50th anniversary in 1989. I do remember being amazed the first time I saw the restored version and how many things appeared more clear, like the cat on the old woman’s lap in the cyclone. Even the Tin Mans face surprised me, because of the metallic shine, it had always read as a blurry glow, and finally all the details of the rivets and the rust stains became clear. I’m going to chock up the gun to the fact that people have seen it so many times in a fuzzier version, where it blended in with the straw of the Scarecrow’s hand, and so it seems a surprise to notice it. This is so stupid – I remember seeing the gun as a kid – it’s so obviously there. Idiots talking about Looney TOONS are morons too – it was Merry MELODIES then Loony TUNES; get it? Stupid millennials and your short/fuzzy memories; smoke less weed. What the hell is wrong with you? Get a life. Guns have only been taboo in pop culture for a generation or so: there used to be a lot more guns as toys, guns in cowboy and Indian movies, etc. So it’s not really odd that he would have a gun in a kid’s movie in 1939. They’re walking through “someplace scary,” so of course, in Old Movie World, somebody needs to be pointing a gun right and left. Could it be that people don’t remember it because when we saw the films as kids, the gun didn’t seem like a big deal? In the movie or video it’s a kids pop-gun. In the picture on this site it’s photoshopped to appear as a real pistol. The picture on this page is a still captured directly from the movie. You can see this from the video on this page as well which shows this scene. Yeah, please do moonraker jaws/ dolly’ s braces, Vaughn. I find it funny that so many people are using the fact that you can’t find the “original” anywhere when you do a Google search. That’s one of the MAIN POINTS, you people criticize and you don’t even understand what the Mandela effect theory is. And there IS proof of the berenste/ain bears issue, there are multiple books that referenced one of the stories or authors and all spelled with an E. I suppose they’re just ALL typos. There’s also a nonfiction book that was published in 1991 that states Nelson Mandelas date of death prior to its publication. And I’ve not found a single person that remembers the Jfk car with another couple sitting in an extra seat in front of them. BUT.. one of the premises of the ME is that it doesn’t affect everyone in the same way, because at different times in history each of us may have been in different dimensions and remember different realities. If you can’t comprehend quantum physics, you really have no business being in this conversation. Especially calling people idiots that remember differently than you… That’s like, the hallmark idiot move on a page like this. It proves that you don’t have any grasp on the theory you’re trying to disprove. The “book” you are referencing (Western Cape Branch of the South African Council for English Education) part of “English Alive” is a fictional publication made from writings of high-school and secondary college students. All you need to do is Google this to get the actual facts. No need to resort to lying. Can you prove that “quantum physics” (do you mean mechanics?) is related in any way to the Mandela Effect? Can you correlate the two with evidence? Can you also show me where I am calling anybody “idiots” or trying to disprove the Mandela Effect? Again, no idea how that is your takeaway if you genuinely read the information presented. I doubt anyone who believes in the Mandela Effect actually comprehends quantum physics. Leanne is one of ONLY A FEW.. Not the ONLY BUT OF A FEWWWWWW.. That actualy makes freaking sense here.. No SINGLE Mandela effect example proves it. Because it cannot be proved. If your discussing the ME you have to understand it completely. Here is a great EXAMPLE SCENARIO . 1. For the moment let’s pretend the ME is 100% real and existing..
2. Lets say the scarecrow NEVER HAD A GUN BEFORE THE MANDELA EFFECT..
3. So you discover the ME and to prove it yourself you go to your grandmothers house and put her OLD SCHOOL “WIZARD OF OZ” VHS Tape into the VCR. 4. So you put the tape in the player and press play, you then fast forward. To your astonishment HE HAS A GUN!!! OMG!!! HOW IS THIS POSSIBLE..
** EXPLANATION – Because AGAIN IF THE ME IS REAL.. That tape has been altered/ replaced / changed WHATEVER you want to call it. When the Quantum change/adjustment happened if the tape was in your reality, *now the tape from the reality with the gun* is NOW THE TAPE YOU ARE PICKING UP..
Can someone explain to why I remember different variations of the full color Tinker Bell intro on many Disney movies that suddenly doesn’t exist. The black and white version is no way close to the color intros that I vividly remember. Please do not use this Lobby Card as evidence of anything. Lobby Cards were created by third party printing companies, and not by the studios. They are often times inaccurate in regards to color, especially during this period. They are essentially colorizing a black and white production still to create a piece of advertising using colors that will grab a viewer’s attention (if not outright guessing at the colors). A quick google image search of classic movie advertising art will provide sufficient evidence. You do not even mention that the printer has also colored the Scarecrow costume blue and purple, when it was green and brown. 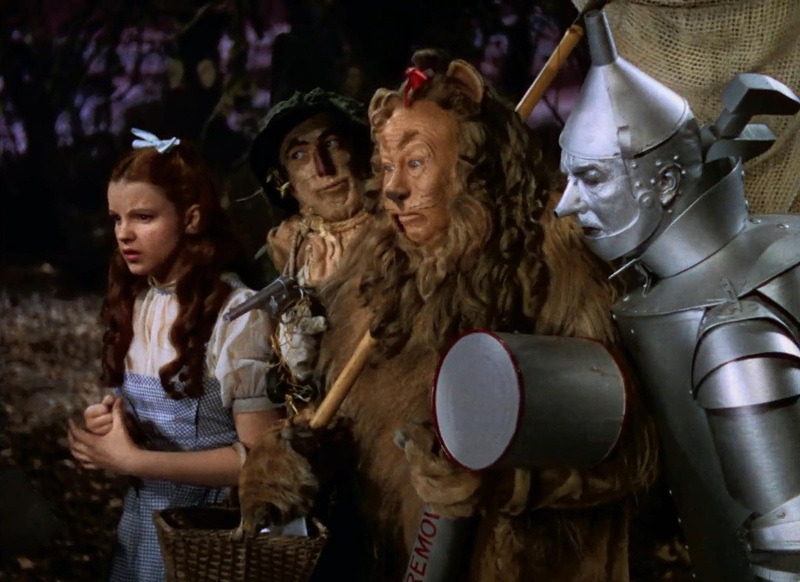 Also, Dorothy’s slippers were SILVER in the Oz books – the decision to make them “ruby slippers” was made by MGM. An argument could be made that the printer was familiar with the books and did not color the slippers, as they expected them to be silver in the film. Thanks for the information on that, will update the post with your feedback. I don’t think I’m using it as evidence necessarily, rather, just using it as an example of more oddities surrounding the gun. I’d also like to point out that this lobby card is from a 1949 re-release of the film, which makes the inaccurate colors more amusing. However, as we all know, films were not readily available to audiences in this period, and their familiarity with them is no where near the heights that internet-fueled, obsessive fanboys have today. After a few weeks in the theater, movies were gone. 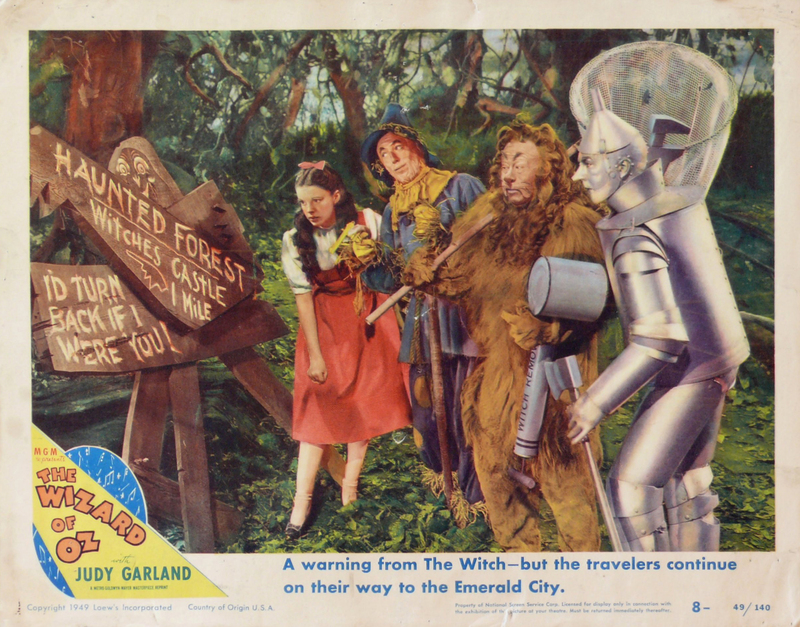 Except for the occasional re-release for major titles (every ten years or so), some films were never seen again until the television period (Wizard of Oz was first broadcast on television in 1956), and later the home video period. Every version of the movie I’ve seen over 40 years clearly shows the gun and other weapons. Glad to see this one explained here. Can anyone rationally explain the Sally Field(s) Oscar acceptance speech change? That one is messing with my head. I’m likely much older than all of you. I’ve enjoyed watching The Wizard of Oz my whole life. Until today I’d never noticed the scarecrow with a gun nor have I ever noticed the tin man with a pipe wernch. I can only rationalize that certain things go unnoticed as they have no infatic significance. Great movie though, right? As an added note, the wicked witch, when sending forth her winged monkeys, mentions that the targets will be no problem at all, and that she is sending a “little insect” on ahead to deal with them – this, surely, was the jitterbug, the scene of which was entirely deleted. Moreover, the tools that the four carry out of the Emerald City did not spontaneously appear, and were surely obtained there — quite possibly (if we were to extrapolate) given into their hands by the Guards to assist them in their Wizard-ordered foray against the Wicked Witch… in another deleted scene. Well spoken. The anger and vitriol is that, they know something is really going on but, don’t see it. They are frustrated for, they are not participants, they are prisoners of their mundane routine. I know several rational, well educated, individuals that scoffed at this “very real phenomenon” until one day they notice something they are certain of has been altered. And, why post a snarky comment? If you don’t believe in the phenomenon, fine. There are numerous forums you are free to participate in therefore, move forward.